Wireless carriers around the world are sprinting to adopt 5G networks to power self-driving cars, virtual reality and smart cities. We’re talking about billions of devices on the same network, not just millions. 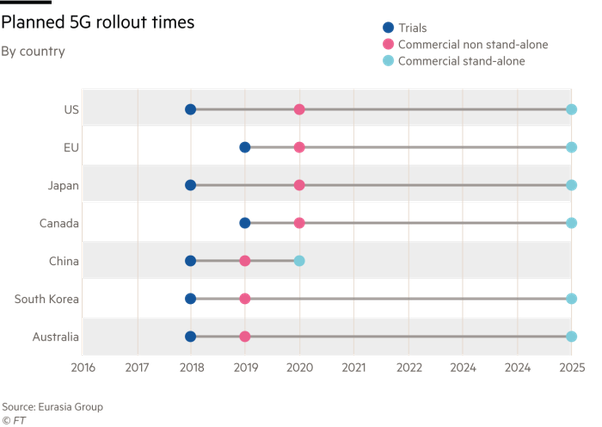 First-adopter countries embracing 5G could sustain more than a decade of competitive advantage. Countries that adopt 5G first are expected to experience disproportionate gains in macroeconomic impact compared to those that lag. China’s Five-Year Plan calls for investing a further $400 billion in 5G and consequently, China may be creating a 5G tsunami, making it near impossible to catch up. Deloitte. 5G is a national productivity tool whose benefits, like those we derive from our railways, are less noticeable to end users yet critical to industry and commerce. 5G is 20 times faster than 4G, serves as the fast backbone of the “Internet of Things”(IoT), handles a million connected devices/km2 simultaneously with millisecond latency and uses power and radio frequencies more effectively with downloads of 20 gb/second, enabling smart factories and smart cities. Gear based on the 5G stand-alone specifications, the standard China is pushing, is designed to run independently of 4G networks so operators will need to rebuild their core networks and buy new 5G base stations to provide higher data speeds and greater capacity, as well as ultra-reliable, low-latency services to support machine-to-machine connection and autonomous driving. Today, many new technologies like IoT and AI are ready for broad application and 5G technology itself is remarkably well developed. 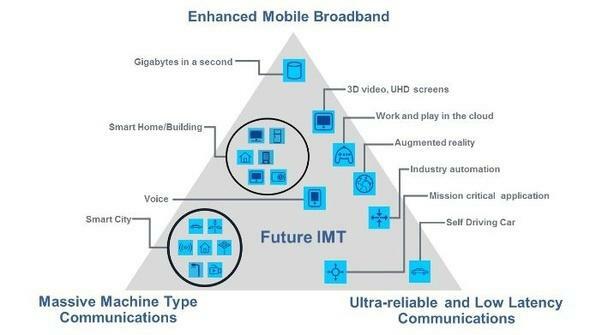 Once implemented, a 5G system provides an almost unimaginable increase in the capabilities of all internet-connected devices. Instead of new devices being standalone, they will create an internet-connected web of things to integrate their activities into an almost-living machine-machine and machine-human environment. The 5G infrastructure market, $528 million in 2018, will grow at a 118 percent CAGR, reaching $26 billion in 2022. Direct and indirect outputs will reach $6.3 trillion and $10.6 trillion by 2030, according to IDC. A crucial element of 5G deployment is the installation of new wireless sites, many of which must be placed on lamp posts and utility poles in densely populated areas. China dominates on that front. During 2017, China Tower, the state-owned cell phone tower operator, added 500 cell sites daily and now has two million wireless sites, compared to approximately 200,000 in the United States. 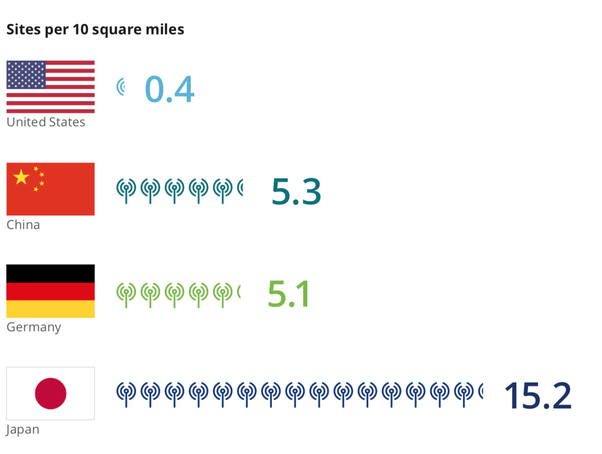 “This disparity between the speed at which China and the United States can add network infrastructure and capacity bodes well for China’s prospects in the race to 5G,” Deloitte said. 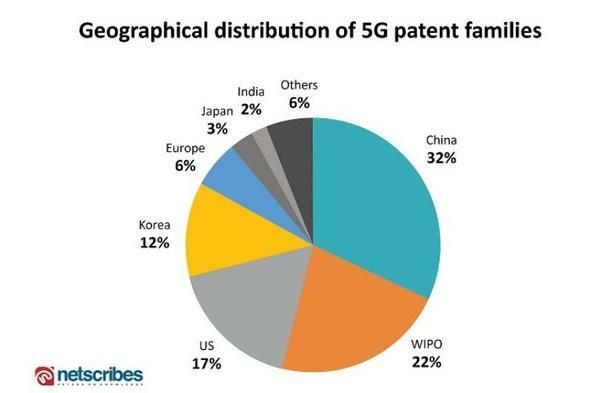 Remarkably, only one company owns significant 5G intellectual property, controls its own silicon from end to end, produces all the elements of 5G networks–including proprietary chips–assembles and installs them affordably on a national scale: Huawei. Non-Huawei customers must integrate more costly, less functional, less compatible and less upgradeable elements, pay twice as much, take twice as long to implement 5G and experience inferior service because Huawei produces every element of 5G systems and assembles turnkey networks–from antennas to the power stations needed to operate them to chips, servers and handsets–at scale and cost. It is literally unrivalled in enhanced mobile broadband. In 2018 Huawei unveiled the world’s first 5G Base Station Chipset, Tiangang, which enables simplified 5G networks and large-scale network deployment. It makes breakthroughs in integration, computing capability and spectral bandwidth and supports the 200 MHz high spectral bandwidth required for future networks while running 2.5 times faster than existing products. Tiangang improves active antenna units (AAU) in a revolutionary way and cuts the weight of 5G base stations by half. Huawei has shipped over 25,000 5G base stations worldwide, deployed 5G networks in more than 10 countries and will deploy 5G in 20 countries in 2019. Tiangang is not the company’s only trick. Andrei Frumusanu says Huawei’s semiconductor division, HiSilicon, is the only company to provide high-end competition with Qualcomm and, in some areas, is comfortably ahead. Its 7 nm Ascend 910 chipset for data centers is twice as powerful as Nvidia’s v100 and the first AI IP chip series to natively provide optimal TeraOPS per watt in all scenarios. Its 7nm ARM-based CPU, the Kunpeng 920 boosts the development of computing in big data, distributed storage, and ARM-native application scenarios by 20%. Its Kirin 980 CPU is the world’s first commercial 7nm system-on-chip (SoC) and the first to use Cortex-A76 cores, dual neural processing units, Mali G76 GPU, a 1.4 Gbps LTE modem and supports faster RAM. With 20 percent faster performance and 40 percent less power consumption compared to 10nm systems, it has twice the performance of Qualcomm’s Snapdragon 845 and Apple’s A11 while consuming 40% less power. The Kirin 980 fits 6.9 billion transistors on a chip no larger than a thumbnail. Huawei’s patented modem has the world’s fastest Wifi and its GPS receiver taps L5 frequency to deliver 10cm positioning and supports speeds up to 1.4Gbps and 2,133MHz LPDDR4X RAM. Huawei’s 5G phone will launch in June this year. Apple will release its first 5G handset in September, 2020. Beijing’s four telcos are spending 30 billion yuan (US$5.4 billion) on a 5G network in the city by 2022 and applying the technology to infrastructure like the new airport, the new satellite city and the 2022 Winter Olympics. The city, home to many of the country’s top tech companies, plans to achieve 200 billion yuan of 5G related revenue by 2022. 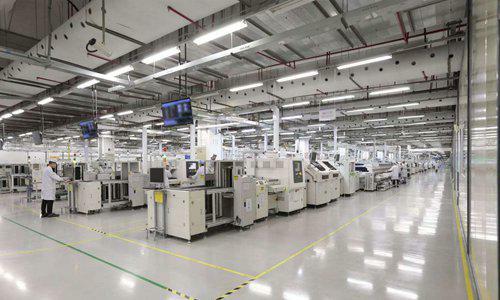 Beijing has set up product innovation centers, special projects and manufacturing bases for developing the key components, including radio frequency parts and chips. The city aims to have its tech companies reach a 10 percent share in the global 5G component market. “Obtaining breakthroughs on developing core components for the 5G network and putting them into industrial use is the primary task for developing the 5G industry in the city,” says the mayor’s plan. Xiongan New Area, a brand new city of six million located sixty miles from Beijing, which will welcome its first residents in 2020, is being wired for 5G. Residents will find no traffic lights, many autonomous vehicles, face recognition providing seamless access and be able to reach the capital via a driverless maglev train costing the same to build and operate as regular subways but traveling silently at 120 mph, with no moving parts. A literal city of the future, courtesy of 5G, Xiongan is designed to deliver the same relative productivity gains for its residents that the Industrial Revolution gave England’s in the 19th century. Snowden’s revelations suggest Huawei is more sinned against than sinning. The NSA’s ‘Tailored Access Operations’ unit broke into Huawei’s corporate servers and by 2010 was reading corporate emails and examining the source code in Huawei’s products.“We currently have good access and so much data that we don’t know what to do with it,” boasted one NSA briefing. Slides also disclosed that the NSA intended to plant its own backdoors in Huawei firmware. In 2014 the New York Times, Time and Reuters revealed that the NSA had infiltrated Huawei headquarters, monitored all of its executives and gone through the company’s entire data infrastructure. One goal was to find links between Huawei and the PLA and the other was to find vulnerabilities so that the NSA could spy on nations through computer and telephone networks Huawei sold, as it did through Cisco’s, which had installed ‘back doors’ for the CIA. The Times said its story of operation Shotgiant was based on NSA documents provided by Edward Snowden. The NSA planned to unleash offensive cyber attacks through Huawei if ordered by the President, “Many of our targets communicate over Huawei-produced products. We want to make sure that we know how to exploit these products,” the Times quoted an NSA document as saying, to “gain access to networks of interest” around the world. Bien Perez and Li Tao say, “The Chinese government wants every industry to use the most advanced infrastructure to upgrade productivity. This is a strategic agenda, and they think that 5G will help. China has very ambitious plans to promote the industrial internet of things, cloud computing and artificial intelligence (AI), the capabilities of which require the support of brand-new 5G networks. For example, self-driving cars require sensors, AI and roadside base stations for fast and reliable connectivity to allow vehicles to talk to each other to avoid collisions and avoid pedestrians. Today’s 4G networks cannot meet those quick response times. China’s plan for an aggressive 5G roll-out is in line with the Made In China2025 road map. Initially, this focused on the domestic telecoms sector’s ability to increase broadband penetration nationwide to 82 per cent by 2025 as part of a push for industrial modernisation. Another objective was to see local suppliers making 40 percent of all mobile phone chips used in the domestic market. Under an updated version published in January, Beijing now wants China to become the world’s leading maker of telecoms equipment. Smart factories will integrate the entire factory production process, arranging the smooth transfer from minimal energy, raw materials and water inputs and the just-in-time delivery of subcomponents to the optimised assembly line production of custom-designed-and-ordered by customers to the effective delivery of these products to the user and the continual (and maybe continuous) product reporting of its use, effectiveness and location. Smart cities will have driverless cars, buses and delivery trucks and ports and airports. The smart economy will have very fast HST intercity services, along with transparent data on the operation of mines, energy generation, transport, communications and government. Medical monitoring and the rise of the extended healthspan technology will free China from the dependency trap because people are likely to remain healthy all their lives using continuous medical assessment through an internet bangle. President Trump has attacked the Made In China 2025 policy because the US, stuck in neoclassical macroeconomics, is committed to a system which not only does not produce the goods but also can’t afford the essential infrastructure required for the next major advance in the ongoing industrial revolution. The decision will put the Five Eyes countries ten years behind China in 5G and its associated technologies. The Germans correctly describe their version of China2025, Industrie04 as “the fourth industrial revolution.” The 5G stakes are so big that, if Germany rejects Huawei it risks committing economic suicide.